In reality Danny is not a tropical storm any longer. Winds are probably gusting to tropical storm force in the squalls well to the east of the center. The Hurricane Center is not downgrading Danny because they do not want to yo-yo the advisories if Danny were to strengthen some again. This is probably a good move to stay on the conservative side. Overall, the recent developments bode well for travelers and those living on the Northeast coast. The lack of development and the speed at which Danny will be moving later today and tomorrow will help minimize effects. High surf, a period of gusty winds, and heavy showers is still likely especially on the coast of the Northeast. Visible satellite imagery shows that the center of circulation is totally naked. 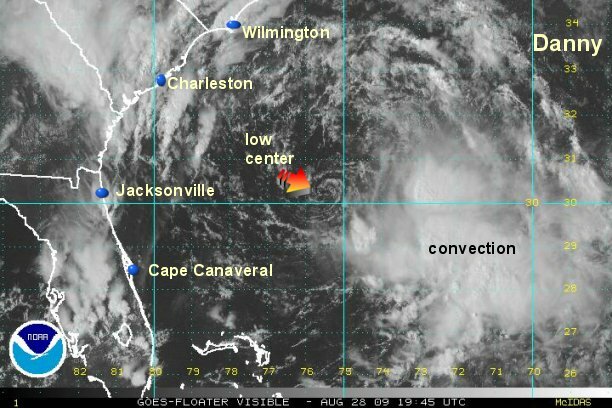 Significant development can not occur if convection can not build over the center. 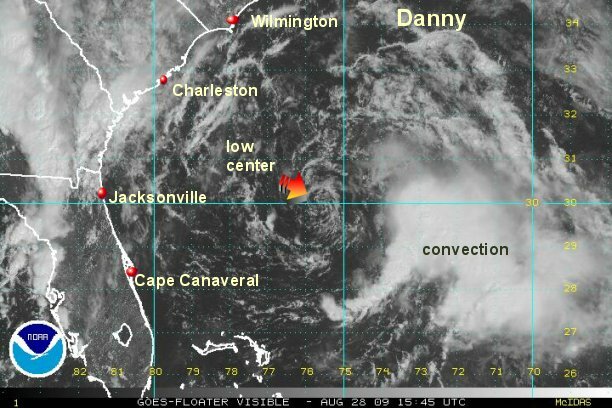 As of 12:30 pm edt /ast Danny was centered near 30.0° N / 75.7° W or about 370 miles south of Cape Hatteras, North Carolina. Top sustained winds are estimated at 35 mph (NHC estimates 40 mph). Movement is to the west at 5 mph. Danny will rapidly move up the eastern seaboard tonight and Saturday. Danny will likely remain as a minimal tropical storm then transform into an extratropical cyclone as it approaches Nova Scotia. Even though Danny is a lesser threat now, interests in the Mid-Atlantic and New England U.S. coasts should follow the latest developments with this tropical storm. Right now it appears that Cape Cod is the highest risk for some of the effects from Danny. If you live near the Northeast and Mid-Atlantic coast continue to follow Danny. In reality Danny is not a tropical storm any longer. Winds are probably gusting to tropical storm force in the squalls well to the southeast of the center. The Hurricane Center is not downgrading Danny because they do not want to yo-yo the advisories if Danny were to strengthen some again. This is probably a good move to stay on the conservative side. Overall, the recent developments bode well for travelers and those living on the Northeast coast. The lack of development and the speed at which Danny will be moving tonight and tomorrow will help minimize effects. High surf, a period of gusty winds, and heavy showers is still likely especially on the coast of the Northeast. As of 5:00 pm edt /ast Danny was centered near 30.4° N / 75.4° W or about 330 miles south of Cape Hatteras, North Carolina 810 miles south southwest of Nantucket, Massachusetts. Top sustained winds are estimated at 35 mph (NHC estimates 40 mph). Movement is to the north at 6 mph. Danny has lost its tropical characteristics and remains disorganized. A frontal system is approaching the eastern seaboard and is absorbing Danny. Still, a large area of moderate to heavy rain is near the Mid-Atlantic coast extending into New England. Seas remain in the 12-18' range well offshore of the Southeast coast and 5-9' closer to shore. Seas will begin to subside as this system rapidly moves into eastern Canada over the next 24 hours. This will be our (and NHC's) last update. As of 5:00 am edt /ast Danny was centered near 34.3° N / 74.6° W or about 80 miles southeast of Cape Hatteras, North Carolina 540 miles south southwest of Nantucket, Massachusetts. Top sustained winds are estimated at 35 mph (NHC estimates 35 mph). Movement is to the north northeast at 30 mph.